A beryllium tweeter is the highlight of these new speakers – do they really ‘redefine performance expectations’? They clearly don’t believe in sitting on their hands at Revel as the Performa3 M106 and F208 speakers have recently been subject to wholesale revitalisation, creating the PerformaBe range, said to ‘redefine performance expectations’. Comprising the M126Be standmount/bookshelf speaker and the F228Be we have here, the new models are available in a choice of high-gloss piano black, white, American walnut or metallic silver and, while the use of ceramic-coated drivers is familiar Harman/Revel fare, the new talking point is a beryllium dome tweeter. In the two new speakers, a 25mm beryllium dome is used, Revel pointing out that ‘Compared to other metal tweeter diaphragms like aluminum and titanium, [it] offers 4.5x the stiffness and 3x more damping, and does so at only half the weight’. And if you hadn’t already got the message, it goes on to draw comparisons with the material of choice for British rival B&W. It says: ‘Diamond vapour deposit diaphragms offer similar characteristics for stiffness and damping, but they do so with a weight penalty that limits performance in comparison to beryllium’. drivers in the speaker. This, Revel says, ensures the tweeter displays similar directivity to the midrange, while also boosting the treble unit’s efficiency, dynamics and power handling while lowering distortion. This may be the most obvious change here, but much has been reworked elsewhere. For example, the midrange driver is a new version of the ‘Deep Ceramic Composite’ coated aluminium cone, redesigned with a larger 130mm diaphragm and a slimmer surround for greater air-shifting, along with a larger voice coil and ceramic magnet technology claimed to reduce compression and boost dynamic ability. Like the twin 200mm bass units, which also use the DCC cone, the midrange is built into a rigid, cast aluminium basket, the intention throughout the design being a speaker that plays louder and cleaner. Meanwhile the crossover, operating at 260Hz and 2.1 kHz, uses Revel’s usual high-order slopes, and is built using film capacitors and air core inductors in the midrange and tweeter circuits. Bi-wiring/bi-amping is possible once jumper plates between the twin sets of terminals are removed. Bass is tuned via a front-venting reflex port, using identical flares on both the internal and external openings to reduce compression effects and port noise, with foam bungs provided should you need to tame the low-end. We left the bungs out to make the most of the bass weight here. If a drive unit is to behave pistonically, and not sacrifice sensitivity achieving it, then its diaphragm material must have a high ratio of stiffness to mass (more precisely, of tensile modulus to density). This determines the speed of both longitudinal and bending waves, and must be sufficiently high to force bending resonances – the breakup modes revealed in our CSD plots every month – above the driver’s passband. Setting aside exotic composite materials, the best way to achieve this is to use a low-density metal. Aluminium is the favourite because it’s relatively inexpensive and easy to work, and can be made stiffer by suitable anodising, as in the DCC mid and bass drivers here. Magnesium and titanium are less widely used but perform similarly since all three metals have a speed of sound of about 5000m/s. To do significantly better requires the use of beryllium which, with a speed of sound of 12,000m/s, is far and away the best metal for the job. But it’s very expensive and, as a vapour or in finely particulate form, highly toxic. It didn’t take much work to have the F228Be performing well in editor PM’s listening room – we just kept them a sensible distance from the rear and side walls, with a little toe-in to firm up the stereo image, and levelled up on the substantial spikes provided. These spikes are reversible, with a pointed end for carpet-piercing, and a rounded one for use on hard surfaces. The enclosure itself makes use of curved panels formed from 25mm layered wood to limit internal reflections and resonances, aided by extensive internal bracing at strategic points. The grilles attach magnetically if required, and the finish of the cabinets is exceptional, Revel saying it was ‘developed and overseen by Italian luxury cabinet makers’ and that it ‘exceeds automotive finish quality’. Certainly the speakers have in-room appeal, being surprisingly compact while at the same time combining a purposeful look with relatively soft lines. It’s a good mix of the ‘technical’ and the domestically acceptable. Start playing some favourite tracks through the F228Be speakers and they’re fast, tight and beautifully extended, instantly delighting with the solidity of the soundstage and stereo images they create. On the end of the HFN Melco/dCS Vivaldi One/ Constellation Audio system [HFN Feb ’18/ Dec ’17], they projected an impression of ‘rightness’ with the first couple of tunes, and then went on to create an ever-growing sense of listening to something really rather special. Immediately obvious was the knack the F228Be has of not just generating significant sound pressure levels when required, but doing so without ever letting slip its grip on the detail and ambience of a performance. The secret is the way the drivers knit together to deliver a musical whole, with none of that obvious handing-over between drivers present in lesser speakers. Instead, the skill of these Revels is that they just present a wall of sound before the listener, into which the speakers themselves disappear as the music extends between and beyond them in three dimensions. Even better, although I noted the benefits of a slight toe-in to firm up the soundstage image, these are no ‘sweet spot’ speakers, but instead can conjure up a more than impressive sense of stereophony even for listeners well off-axis. They certainly delivered a lovely orchestral warmth and depth, allied to superb levels of detail, with Ravel’s ‘La Valse’ from the Boulez Conducts Ravel set [Sony Classical SK 92758]. There’s richness to the sound here without it ever becoming cloying or overblown. The same was true with a more recent recording, the Daniel Barenboim/ Staatskapelle Berlin Elgar First Symphony [Decca 478 9353; 96kHz/24-bit], where the sense of orchestral scale was delivered completely without effort, as was the ambience surrounding the performance. There was beautiful fluidity in the strings and a fine rhythmic flow, allied to solid attack and drive thanks to the speakers’ speed and agility. And the way they cruised through the lyrical fourth movement theme, at around 6.20mins, was simply magical, every note having its place clearly delineated in the overall musical sweep. There are times these speakers can be just breathtaking: and this was one of them. Another was the way these speakers snapped out the effects-laden mix of Big Audio Dynamite’s ‘Medicine Show’ [This is…; CBS 462999 2]. Through some loudspeakers this track can sound thin, abrasive and tinny, yet here none of the slam was sacrificed. Instead, it was underpinned with solid bass impact, while the snippets of sound effects peppering the mix sliced through the music. Similarly, Springsteen’s ‘Candy’s Room’ [Darkness On The Edge Of Town; CBS CDCBS 86061], opens with a fine sense of intimacy on the lead voice, and crisp, fast percussion. The balance is punchy yet satisfyingly weighty, and not without swagger. This album is hardly demonstration quality, but via the F228Be speakers it was really rather big and magnificent. Taking it down a little with Chip Taylor and Carrie Rodriguez’s ‘Sweet Tequila Blues’ [Let’s Leave This Town; Train Wreck TWO 19], I’ve heard speakers able to delve deeper – though not much – but there’s no gainsaying the impression of real performers in real space. Again the speakers reinforce that impression of being designed for a good time, but also with culture and refinement. That ability to sound intimate and warm while keeping plenty of power in reserve was also in evidence with T Rex’s ‘Life’s A Gas’ [Electric Warrior, deluxe edition; Universal/A&M 533 780-3]. The sound was close-focused without being forced, evoking fine studio ambience, and the voice and instruments sounded totally natural. This lack of effort also serves well a huge and atmospheric recording such as Masaaki Suzuki Plays Bach [BIS Records BIS-2111; DSD64]. The instrument was placed in a realistic space on the Prelude and Fugue in G Major, BWV535, while the integration of the drivers created a seamless frequency range. With keyboards on a smaller scale, Paul Lewis’s recording of Mussorgsky’s Pictures At An Exhibition [Harmonia Mundi HMC902096] showed off the way the speakers image. Piano had rock-solid focus, and there was remarkable air in the sound. Let the Revels begin: these wonderfully enjoyable speakers are able to conjure realistic scale and impact while conveying all the detail and flow of whatever’s being played. With effortless dynamics, fine integration and the ability to create excellent 3D soundstage images, they deserve very serious auditioning if you’re in the market at this level - and show a clean pair of heels to some more expensive rivals, too. We couldn’t quite match Revel’s claimed 90dB sensitivity for the F228Be. While the simple response average came close at 89.5dB, the more representative pink noise and ‘music’ values (88.9dB and 88.7dB, respectively) suggest that 89dB is more realistic. Quite low impedance is used to help achieve this, the minimum modulus of 3.4ohm indicating a 4ohm nominal figure, not Revel’s specified 8ohm. Impedance phase angles are large at low frequencies, resulting in a minimum EPDR (equivalent peak dissipation resistance) of 1.6ohm at 24Hz. While this isn’t far off the 1.7ohm we typically find with modern high-sensitivity designs, further dips to 1,7ohm at 333Hz and 1.9ohm at 74Hz indicate that the F228Be is a tougher than average load to drive. Forward frequency responses, measured at 1m on the tweeter axis, show an overall trend that’s flat but with dips around 1.6kHz and 7kHz [see Graph 1, below]. Despite these, the response errors (300Hz-20kHz) are modest at ±3.1 dB and ±2.8dB. Similarly, the pair matching error over the same frequency range is fine at ±0.9dB, improving to an excellent ±0.5dB if its narrow-band disparity at 1.8kHz is ignored. Diffraction-corrected nearfield measurement – the summed response of drivers and port – indicated a bass extension of 46Hz (-6dB re. 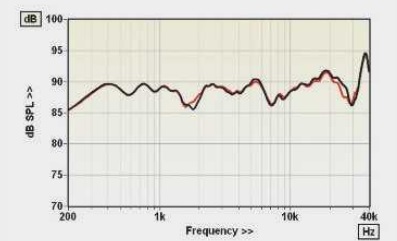 200Hz), an initial second-order decline in output below 70Hz becoming steeper below 30Hz. At the opposite end of the frequency range the response is maintained to over 40kHz (-6dB re. 10kHz) but what appears to be a 37kHz resonance frequency for the beryllium tweeter is a little disappointing given that it is possible to achieve a similar result using aluminium. 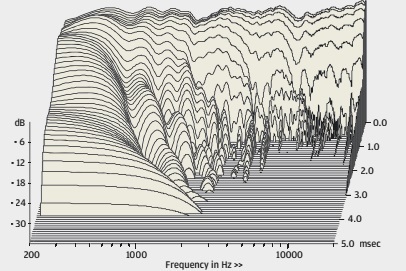 The CSD waterfall [Graph 2] shows only low-level treble resonances.